Celebrate one of the biggest parties in the Scottish calendar a dram of Robert Burns Single Malt from the award-winning Scotch whisky producer, Isle of Arran Distillers this January 25th. The only whisky endorsed by the World Robert Burns Federation, it’s the perfect choice for raising a birthday toast to Scotland’s most beloved poet. Born just across the water from Arran in Ayrshire, The Bard is commemorated by the Isle of Arran Distillery with this sweet and creamy malt with flavours of honey and toffee-glazed pecans. Smooth and mellow, it’s ideal for cocktails or enjoyed by itself over ice or with a drop of water. James McTaggart, Arran’s master distiller, said: “As patrons of the Robert Burns World Federation, we wanted to invoke the inclusive spirit of Burns Night with the Robert Burns Single Malt, it’s a dram that welcomes newcomers to whisky without sacrificing depth of flavour. 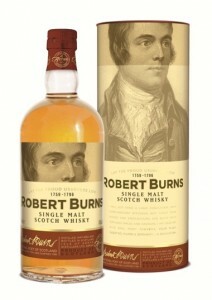 Retailing at £29.99, the Robert Burns Single Malt is available to buy online at http://www.arranwhisky.com/ and in specialist whisky stores.